I originally bought The Sneaky Chef: Simple Strategies for Hiding Healthy Foods in Kids’ Favorite Meals to do a Recipes of the Damned post about it. I first heard about the book last year when its author, Missy Chase Lapine, alleged that Jessica Seinfeld’s similar book Deceptively Delicious was a rip-off of hers. At the time I was mildly interested in the question of whether Seinfeld’s publishers, who had previously rejected Lapine’s manuscript, had really borrowed any of her ideas or if they had just preferred Seinfeld because she happens to be married to Jerry Seinfeld and is thus a celebrity draw. I was more concerned about the idea that there were two books out urging parents to lie to their children about their food — more precisely, to sneak healthy ingredients like spinach and wheat germ and cauliflower into food without kids noticing. I’m a firm believer that picky eaters are made, not born, and that it’s part of a child’s development to be exposed to new foods and to learn about different tastes. I think it’s important for people to knowingly discover whether they actually like foods; after all, we all have genuine likes and dislikes, and it’s part of growing up to learn what those are. And I have serious issues with the idea of deceiving kids; I think that kind of thing can backfire and erode kids’ trust in parents, which could be particularly troublesome when it’s time to teach them about things like the evils of drugs. … I liked them. A lot. It should be clear that Lapine is not oblivious to my worries about all the possible downsides of deceiving your kids in this way. She spends a good chunk of time explaining the concept and the reasons behind it, and acknowledges that “sneaking” is not a permanent solution, but a way to buy some peace and some time in which to more calmly continue to educate kids about good choices — especially very young children who don’t respond to logical persuasion. “Isn’t it part of our job as parents to train our kids to know a good diet from a bad diet? The answer is yes, but we can’t do it in a war zone,” she argues. The book got its origins in nightly mealtime battles with her own children who, in perfect consistency with known patterns of growth and development, were resistant to new foods, suspicious of certain tastes and textures, and determined to use their ability to say “no” as their one way to assert control in a world that really didn’t give them any other power over their lives. Lapine argues that sneaking in vegetables enables kids to enjoy food and get good nutrition without making every bite a battle, while you continue to teach them about balanced diets and to introduce new foods regularly. I still have misgivings, but I’m not a parent. And every time I think of a fresh argument against concealment, I think of my childhood, when my sister — a picky eater if ever there was one — rebelled and rebelled against foods she didn’t like, making for ongoing conflict at home. I don’t know if sneaking in food this way would have made much of a difference to her health or her dietary interests; as far as I know, she’s still fairly picky. But it wasn’t fun to endure the arguing, and maybe that could have been different. At any rate, I set aside my questions about the ethics of “sneaking” as I got started on this cooking project. I wasn’t cooking for kids, and didn’t have to worry about the right or wrong of fooling them. My questions were these: Can you tell there’s something hidden in the recipes Lapine presents? If so, can you tell what it is? And most important, how does the food taste? My husband offered himself up as an experimental subject; he would know that there was something hidden in the food (it just wasn’t practical to keep him from knowing what nights I would be doing the concealment books), but he wouldn’t know what, or whether it was in all dishes in the meal. So he would serve as the suspicious diner, which I thought was a pretty good gauge of whether the recipes succeed at sneaking in the vegetables. 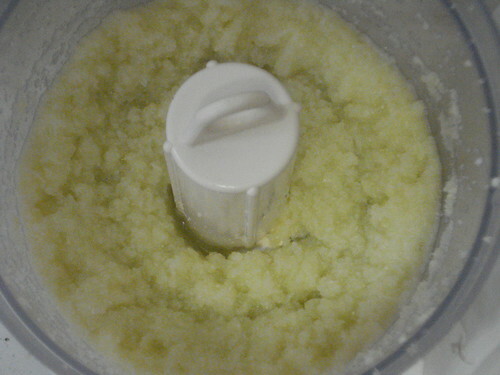 So once I’d decided which dishes to make and done the necessary shopping, my first step was to make purees. 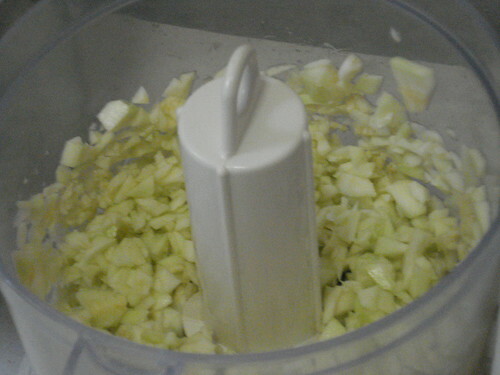 I started with “white puree,” a blend of steamed cauliflower and raw zucchini, with a little bit of lemon juice and enough water to make for a smooth mixture. I steamed the cauliflower until it was tender, pulsed peeled zucchini in a food processor with the lemon juice, added the cauliflower and processed in bursts until it was smooth. Into the fridge with it. 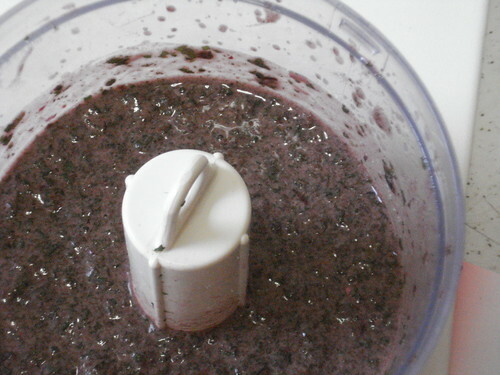 Next up was “purple puree,” a blend of cooked spinach and blueberries, also with a bit of lemon juice. I think the purpose of the blueberries in this is to help offset the distinctive taste of spinach, though blueberries are nutritious foods in their own right (but ones that kids are more likely to approve of). I may have made this one a bit too liquidy, but it blended well after a few bouts of pulsing. Into the fridge with this as well. 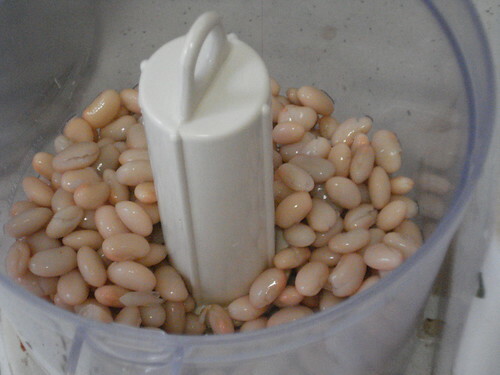 The easiest puree was white bean puree, which is pretty much what it sounds like: drain and rinse a can of white beans (Great Northern, in this case) and process them into a smooth paste, adding a bit of water as necessary for texture. 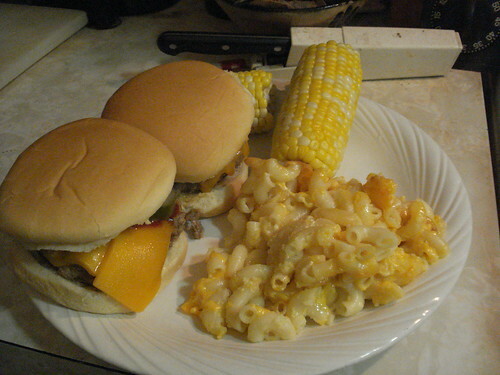 I had decided to make a somewhat indulgent meal of macaroni and cheese plus burgers, with chocolate chip cookies for dessert. 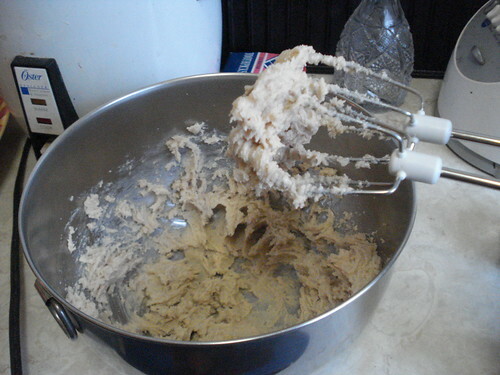 I made the cookies first. 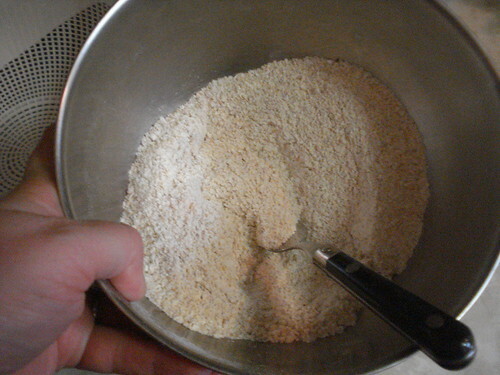 I started with a flour blend; Lapine offers this as one of the sneaky recipes, equal parts white flour and whole wheat flour and wheat germ, but I just blended enough for this recipe. 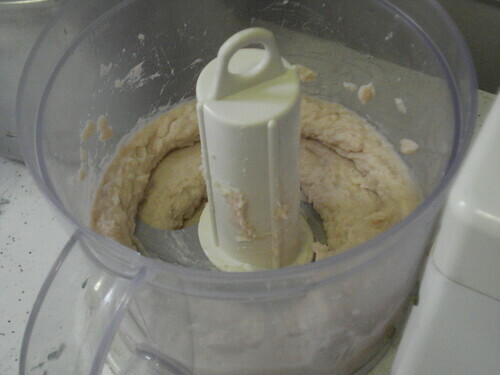 I also used the food processor to grind some rolled oats and almonds, which I added to the flour along with some baking soda and salt. In a separate bowl I creamed a stick of butter with some white and brown sugar — a good deal less than one would use in a conventional recipe — and then blended in an egg, some white bean puree and a generous helping of vanilla extract. 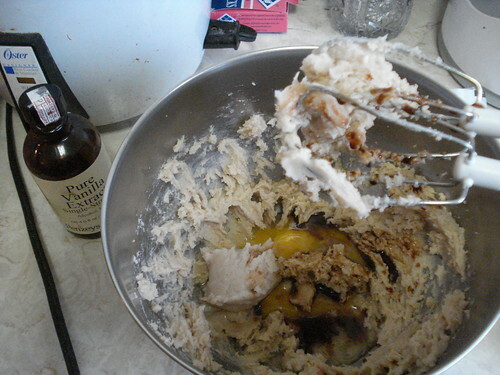 The butter mixture whipped up nicely, and mixed smoothly with the flour as well. 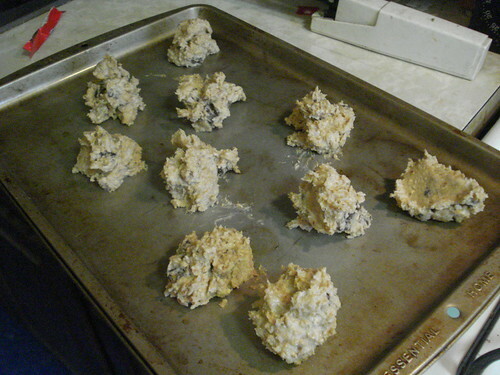 I stirred in chocolate chips and some walnut bits, and dropped the cookies onto baking sheets. 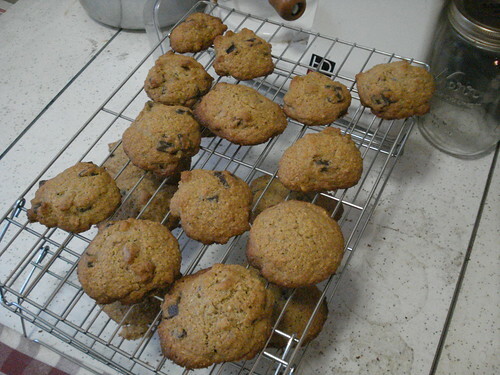 They don’t look like my usual chocolate chip cookies, but you wouldn’t guess they contained beans from looking at them. I ate one while it was still warm from the oven and found it really good. The almonds and vanilla help intensify the flavor. On to the macaroni and cheese. This one was very easy: I boiled macaroni until it was a bit underdone and drained it. 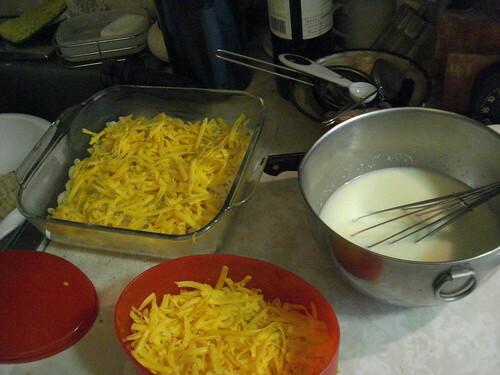 In the meantime I grated cheddar cheese (I was supposed to use reduced-fat cheese but I don’t think my neighborhood market even stocks any, though I simply forgot to look), and mixed some skim milk with some of the white puree and a bit of salt. 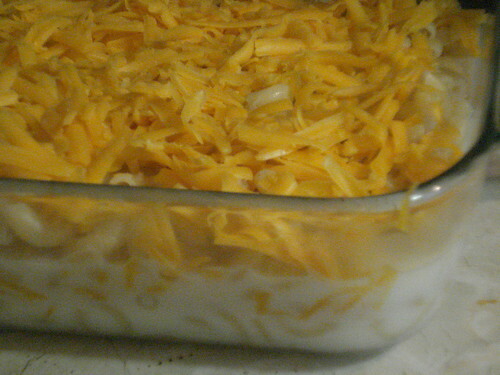 I put half the macaroni in the baking pan, topped it with half the cheese, then added the rest of the macaroni; I poured the milk mixture over the whole thing, then added the remaining cheese and put it in the oven. 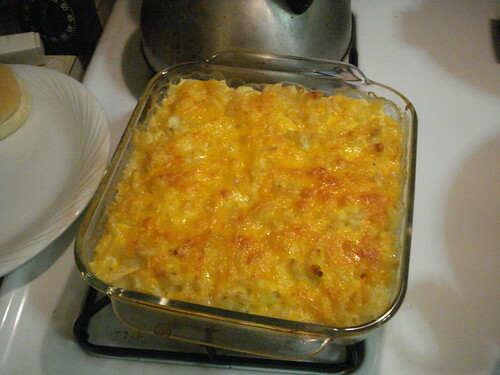 This is somewhat easier than my favorite Martha Stewart mac and cheese recipe, which has you make a traditional bechamel sauce and stir in the cheese before pouring it over the noodles; it’s also lower in fat (no butter), and would be even lower if I had used the right cheese. Now it was time to prepare the burgers. 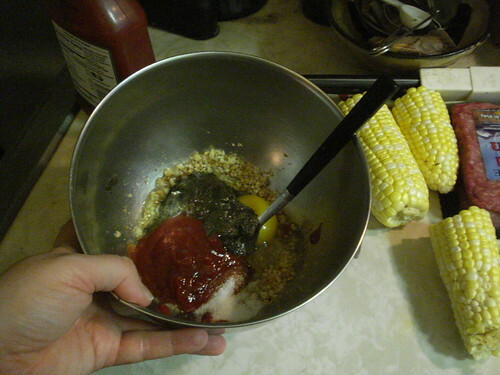 When I make hamburgers I don’t usually stretch the meat, so this was already a departure for me, but it’s pretty common for home cooks to mix in bread crumbs and an egg. 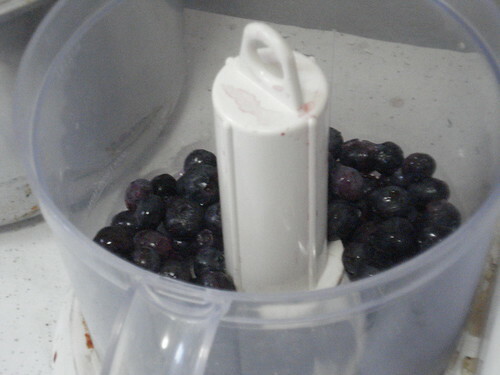 What’s less usual is to add purple puree. 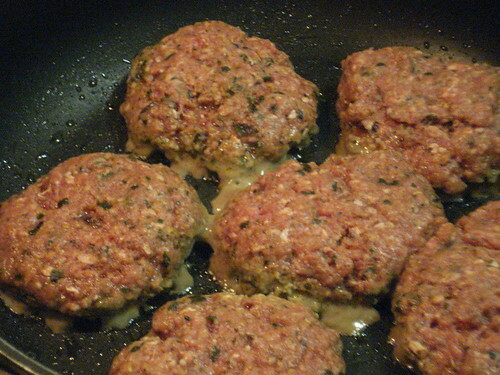 It blended in well, but you could definitely see the spinach flecks in the uncooked meat blend. 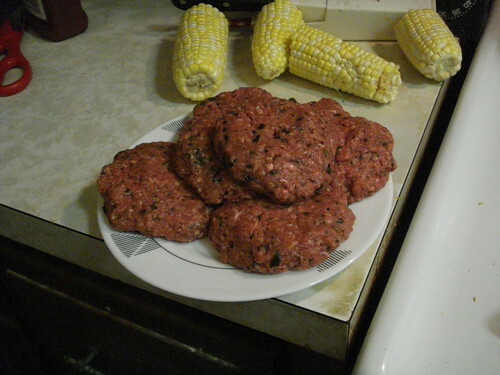 I used ground bison for this, which is already pretty lean, and the resulting burgers were very moist — they were almost wet to handle uncooked, and they released a lot of moisture in the pan. This meant they were very juicy to eat, and that’s good. 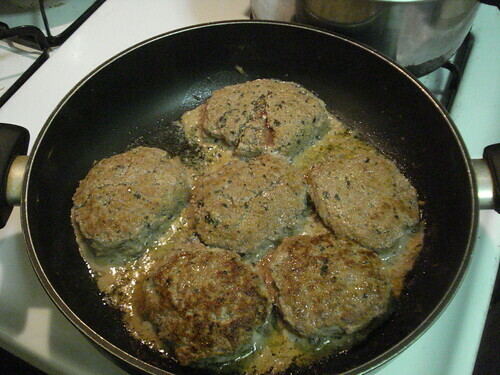 The spinach flecks were harder to detect in the cooked patties; adding some cheese enhanced the concealment. So now came the test: Would Scott be able to figure out what was in the food? He guessed that the mac and cheese might have cauliflower based on the texture he saw while scooping some up, but admitted that if I had said “no, that’s a cheese mixture” he would have believed me. 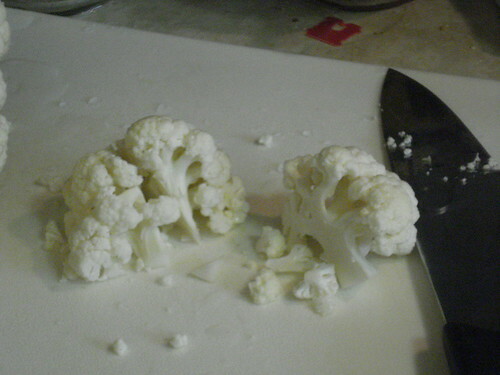 He couldn’t taste the cauliflower, and he was astonished when I told him about the zucchini as well. We both really liked the taste of the macaroni and cheese. The burgers also had him fooled. He could tell there was a bread-crumb-and-egg enhancement, which was different from my usual practice but well in line with the meals of his childhood. He didn’t taste the spinach, and didn’t believe me at first when I told him about the blueberries. 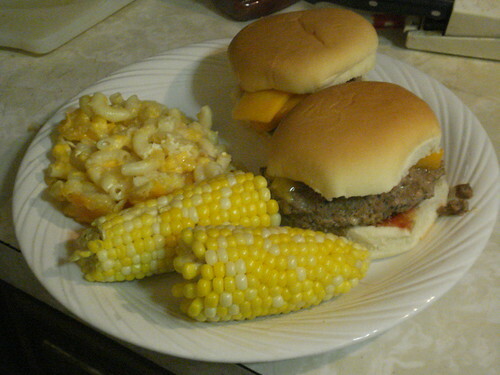 The burgers were juicy and delicious, and the add-ins meant I got more patties out of the pound of meat. Finally, the cookies. 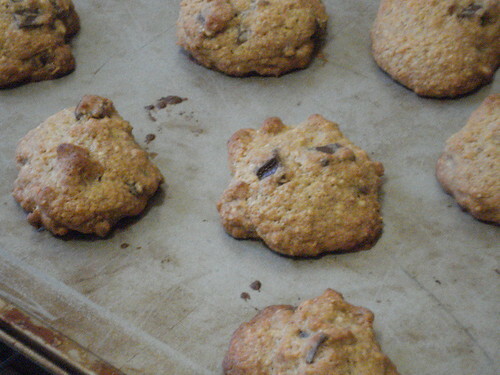 He could tell there was something different about them, that they were a little grainier than usual; the whole-wheat flour and wheat germ accounted for that. He was really surprised when I told him about the white bean puree. Verdict: Success. 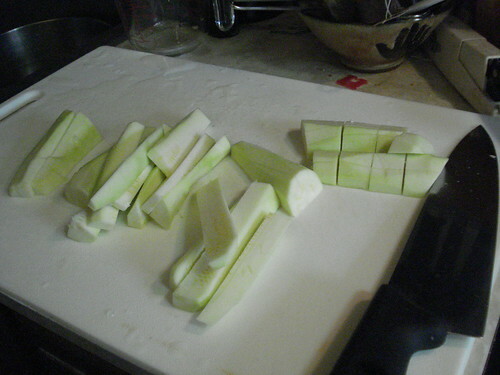 The recipes went three for three on both good taste and effective concealment of the nutritious ingredients. I’m still unsure about being sneaky with kids, but I think these recipes would be great choices for anyone looking to lose weight; you could improve your favorite comfort foods and thus minimize the deprivation that inevitably leads to a desperate binge. 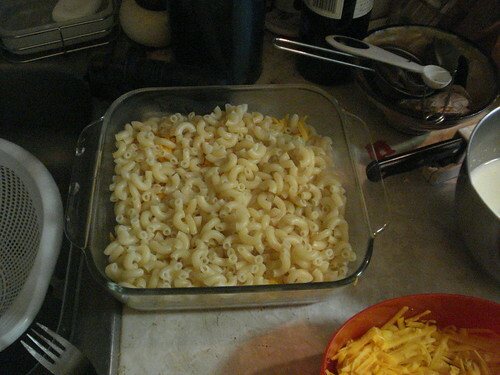 I’ll certainly make the mac and cheese again (not right away — we have quite a bit left over). And I’ll have to see what else I can make with the purees I have left. I make a mac & cheese from a Moosewood cookbook that uses a tofu/yogurt/cheese sauce instead of a traditional cheese sauce that’s pretty good. It’s not that gooey super cheesy stuff we all love, but it is cheesy enough (I use a lot more than the real recipe calls for) and it’s higher in protein and lower in fat than the traditional deal. It’s also much easier to make than the traditional cheese sauce: throw ingredients (sans rotini) in the blender and voy-lah!